Discussion in 'Downhill & Freeride' started by Ridemonkey.com, May 30, 2012. Last year, Taiwanese manufacturer, HT, rolled out a new line of four &#8220;EVO&#8221; flat pedals, all of which follow the same basic formula: ultra-thin platforms paired to a unique spindle dual DU bushings and an outboard patent bearing. The AE03 is one svelte puppy: just 352 grams a set and a mere 11 millimeters thick across most of the body. For comparison&#8217;s sake, I was blown away a few years back when I reviewed Deity&#8217;s Decoy LTs which were just 17 millimeters thick (back then, that was considered pancake thin). Time and technology march on. The HT&#8217;s body is made of extruded aluminum that&#8217;s been CNC&#8217;d into final shape. Each side of the pedal bristles with 10 steel pins that err on the tall side of the spectrum. The pins are placed evenly over the platform and grip is strong on every shoe I&#8217;ve paired this pedal with. The AE03s sell for $150&#8230;that&#8217;s not stupid-pricey, but it does lean towards the trust-fund side of the cost spectrum. Thin pedals are a dime a dozen these days&#8212;it seems like everyone and their brother has a few in the line up. There are a few goods reasons for that: thin pedals offer more clearance, which means they smack into fewer rocks and you, by extension, spend more time on the bike than off it. Thin pedals also have less of a tendency to roll under your foot during awkward moments than their thicker-waisted brethren and simply offer better pedaling ergonomics than the chunky flats of the past. Having touted the benefits of thin flats, it&#8217;s worth noting that some of the early models from years past **** the bed right quick. Durability simply wasn&#8217;t always on the menu. How will the HTs hold up? It&#8217;ll be interesting to see. I&#8217;ve got a month of riding on them so far, and as you&#8217;d expect, it&#8217;s all peaches and puppies at this point: I haven&#8217;t mangled any of the traction pins, the bushings are hunky dory and the chromoly spindles are doing fine (again, you kind of expect that from steel, but I have bent a few over the years). Since I ride nothing but flats, I&#8217;ll amass some good miles on these pedals before the years out. Look for an in depth review in the near future. Not as thin as Canfield Crampon, but deffinatly intriguing! Would love to get my hands on a set of those! Thin and light will require more maintenance if you want them to last for ever. Little bearings/bushes take more wear/load per rotation. No big deal, but this weight game is costing us in other areas. They do look pretty good. Bit convex looking, I'd run longer pins front and back. Keen to see some compared to another pedal to see how big the platform is. 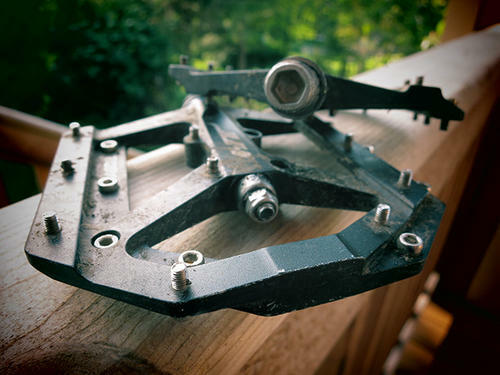 I have been running the new prototype Canfield Crampon pedals for about 6 months now and they have the convex shape that I am now sold on. I used to think concave was the way to go but, with these ultra thin pedals especially, my way of thinking is changed. My foot feels like it is subtly wrapped around the axle, pedaling seems more connected, closer to the clipless feel than any platform I have been on and moving the bike around in the air is more easily achieved. I personally think that passing by these new flat pedals because they are convex would be a mistake. Not on his race bike, think I saw a snap of him on a dj bike somewhere with those flats on it...maybe DIRT? for fun, not serious business. the HT press release said he's supposed to be helping develop a clipless pedal along with lopes#55. as far as HT flats - i've been on the AE-01 for a few months now and love them. one thing HT is doing that i think helps is they are using the thinner diameter pins (same pin as wah wah's) which makes a noticeable difference in traction. the thicker pins (spank spike for example) may be more durable but they don't dig into my shoe like the thinner pins. $150 for just pedals? Maybe I'll buy them if I win the lottery. I have been running the new prototype Canfield Crampon pedals for about 6 months now and they have the convex shape that I am now sold on. I used to then concave was the way to go but with these ultra thin pedals especially, my way of thinking is changed. My foot feels like it is subtly wrapped around the axle, pedaling seems more connected, closer to the clipless feel than any platform I have been on and moving the bike around in the air is more easily achieved. I personally think that passing by these new flat pedals because they are convex would be a mistake. I love my PO1NTs with long pins front and back, but that could be due to grip or anything, and they did freak me out at first. With stock pins they feel awesome also. So interesting. yes, interesting. I'd like to try 'em out. $150 could be better spent, though I don't know if HT's MSRPs are enforced. check the big internet auction site. got mine for less than a hundy. I rode the current version of the Canfield Crampons for a few weeks and quickly sold them because I could feel the axle under foot and I didn't like it. I also tried my friends HT's and they felt better to me but still not all that good. I'm not sold on the convex pedal idea. Maybe it feels better if you ride with your arch over the axle? 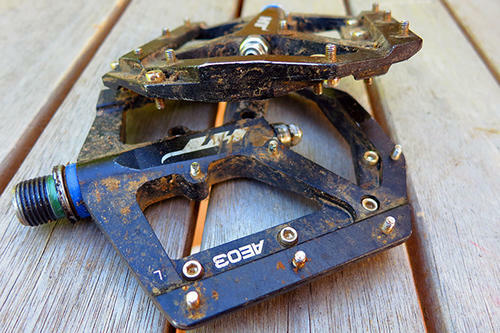 I was not super sold on the current crampons either but am loving the protos with production available super soon. I do find I ride with the axle positioned right behind the ball of the foot most of the time but not so far as the arch.